It’s afternoon as students enter a small USD apartment. There they begin a monthly ritual — preparing dinner for 20. Tonight, it’s taco salad. Tasks are delegated and the smell of sautéed turkey spreads throughout the building. The outreach program is only a few years old. Each month, resident ministers take students to the nearby shelter, introducing them to lives and experiences that are very different than their own. It’s not long before vans pull up in front of a nondescript building with large windows that let in waning sunshine. The students unpack, talking with the women and sharing anecdotes about one another’s lives. By 5:30, it’s time for dinner. After a student-led prayer, the women line up, as students serve up warm comfort food. One large family-style table dominates the room. 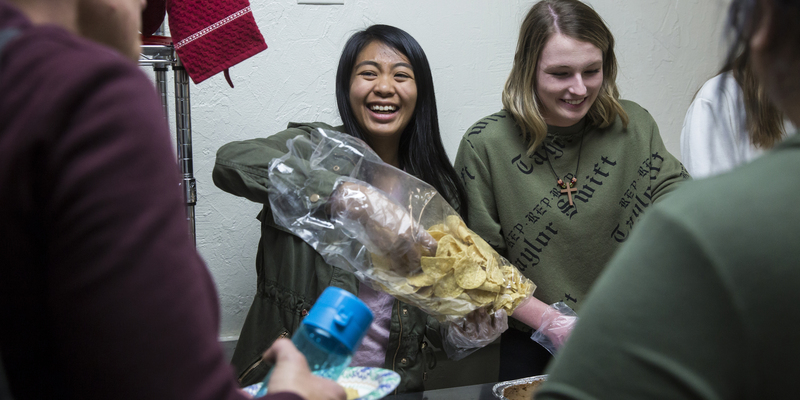 Laughter and conversation fills the area as the dinner companions — students and residents side by side — swap stories and connect over shared interests, life experiences and a good meal. The food helps to break down barriers; nervousness dissipates as students and residents find camaraderie in their shared encounter. It’s nearly seven o’clock. Hugs are exchanged as the students say good night. They climb back into vans and, before long, arrive back on campus and head to the small apartment where they began several hours earlier.